This article contains frequently asked questions about using Lync audio sound (voice) and video. 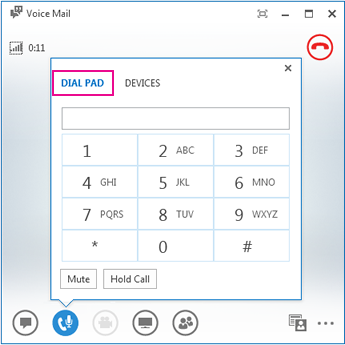 Where is the Skype for Business (Lync) dial pad and how do I use it? Can I make a call without adding someone to my Contacts list? Lync automatically detects your audio and video devices. However, we recommend that you check before making a call or joining a meeting, to make sure they are set up correctly. See Set up and test Lync audio and Set up and troubleshoot Lync video for instructions. Yes, a Lync call is made from your computer to the computer of someone else who is using Lync or Skype. The call is made via computer audio. A Lync call rings at all the recipient’s devices that are enabled for Lync, such as desktop and laptop computer. For details about communicating with external contacts, see Add an external contact in Lync. For more information, see Make and receive a Lync audio call. Where is the Lync dial pad and how do I use it? Yes. You can search for a person by typing their name in the search box. In the search results, pause on their picture, and then click call. Add phone numbers to your contact card so that people know how to reach you by phone. 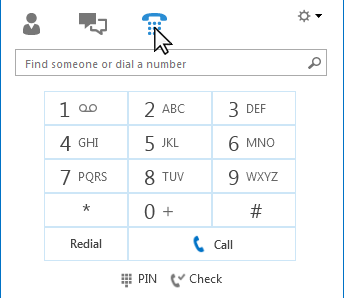 The numbers on your contact card are visible to your Lync contacts based on the privacy relationship you have with them. For details about who sees what, see Control access to your presence information in Lync. For more information about adding phone numbers to your contact card, see Set Phones options. Your phone handset is on the cradle (if you’re using Lync Phone Edition). The device you’re using is selected on the Devices tab, (pause on the phone/mic icon, and click the Devices tab). Use a high quality audio device, replace any defective or damaged devices, and run the set up to make sure it works correctly. We recommend you use a device listed in Phones and devices qualified for Microsoft Skype for Business (Lync). If you’re using the speaker on your phone running Lync Phone Edition and callers complain about background noise, make sure that the phone is on a flat surface, and you are close to the phone.